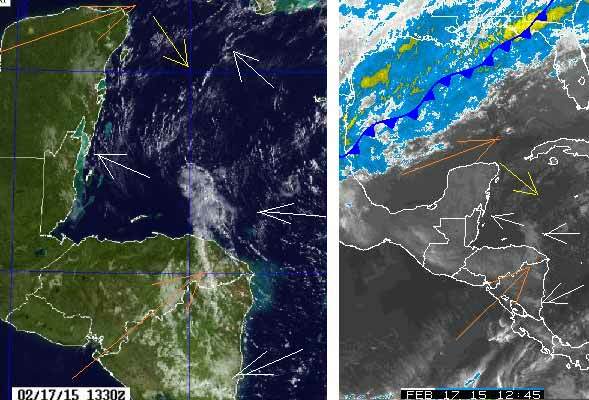 Belize NMS: Mainly fair weather conditions prevail for the next 24 hours and then a cold front will cause an increase in cloudiness, rainfall and winds tomorrow. 24-hour forecast: Sunny, warm and dry today. Mostly clear tonight with little or no rain. Sunny, warm and dry tomorrow. Today: Winds: E-SE 5-15 kts. ; seas: Choppy. ; waves: 3-4 ft.; little or no rain. Tomorrow: Winds: N-NW 10-20 kts with higher gusts; seas: Moderate - rough. ; waves: 4-7 ft.; a few showers. Marine Outlook: Wednesday night:- Winds: N-NW 15-25 kts with higher gusts. ; seas: Rough. ; waves: 5-7 ft.; a few showers and some periods of light rain (mainly south). General Outlook: Sunny with cloudy spells on Wednesday along with a few showers mainly over the sea and coast. Cloudy and windy on Wednesday night with a few showers and some periods of light rain mainly in the south. Last edited by Marty; 02/18/15 06:09 AM. Nearly clear skies this morning. The Caribbean winds are coming in from the east, but spreading out in different directions, some going up towards the Yucatan, other going down towards Panama. But there is still some oncoming over Belize from the ESE There has been a little mid level cloud come from the NW over Yucatan, but that is now disappearing. 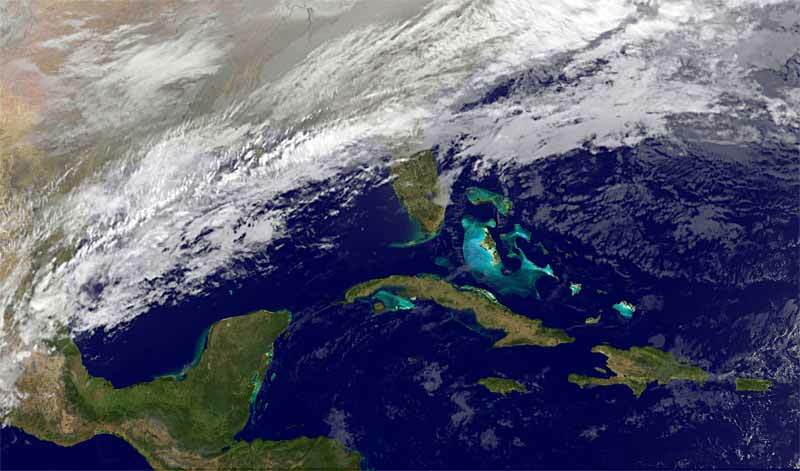 There have been patches of thin cloud go over southern Belize from Honduras, but that is also disappearing. The high level Pacific winds are from the SW causing some cloud over Honduras as it mixes with the Caribbean winds, but I don`t think that will reach Belize. There is another cold front up there over the gulf, I don`t know how far it will come, but it will have some influence on Belize weather over the next day or two. I expect today to be mainly sunny, with some patches of cloud, more cloud developing this afternoon but not rain.